Diabetes. 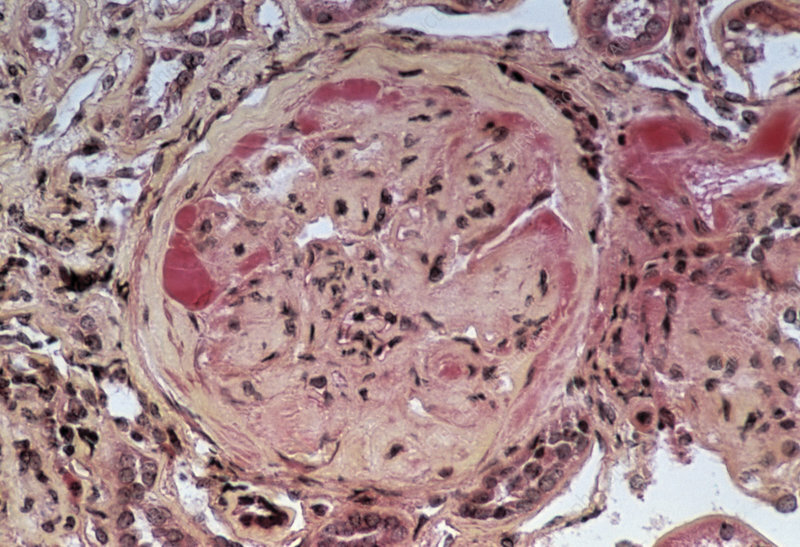 Light micrograph of a section through kidney tissue in a case of diabetes. Diabetes is a condition where the body either cannot use insulin or fails to make enough of it. Insulin, a hormone produced by the pancreas, regulates the levels of glucose (a sugar) in the blood. Diabetes leads to elevated blood sugar levels (hyperglycaemia). Over long time periods, this leads to damage to blood vessels, eyes, nerves and kidneys. Kidney failure may result. Treatment depends on the severity of the diabetes, ranging from insulin injections to a special diet and oral medications. Magnification unknown.